Dietrich is talking about Afterlife, a show that sprawled through artist collective Vox Populi’s galleries last November with a backlit, three-tiered black tower as its focal point. “The space” is the Chinatown studio-share and art gallery Space 1026 which Dietrich belongs to and whose members collaboratively organized the exhibition. It’s a chilly fall day, and we’re drinking hot Pumpkin Spice coffee out of paper cups during Dietrich’s break from his job as a preparator on ICA’s crew. Dietrich helps get our exhibitions up and running by unpacking sculptures from their crates, fabricating pedestals, and positioning works of art just so on the museum’s walls, floors, vitrines, and shelves. He is also a painter whose text-based works resemble old-fashioned shop signs while they spell out timeless discontents: isolation, melancholy, and indecision. 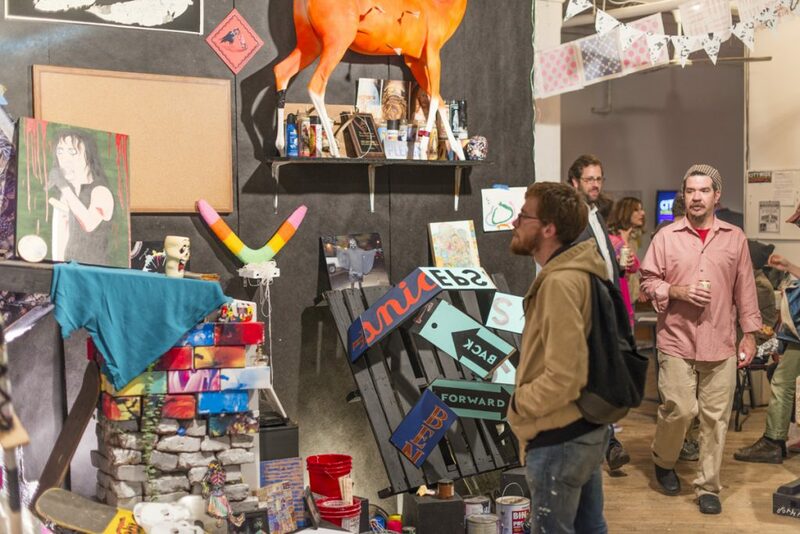 Space 1026 has an impressive history—Shepard Fairey, Jim Houser, Barry McGee, and Rebecca Westcott began their careers here, and the collective has twice exhibited at ICA. Afterlife invoked this cumulative “CV” through a trippy ensemble of studio and exhibition keepsakes that included silver spray-painted bricks, incense sticks, skateboards hand painted with black-and-red snakes, and a Mona Lisa print embellished with miniature sketches of nuns. 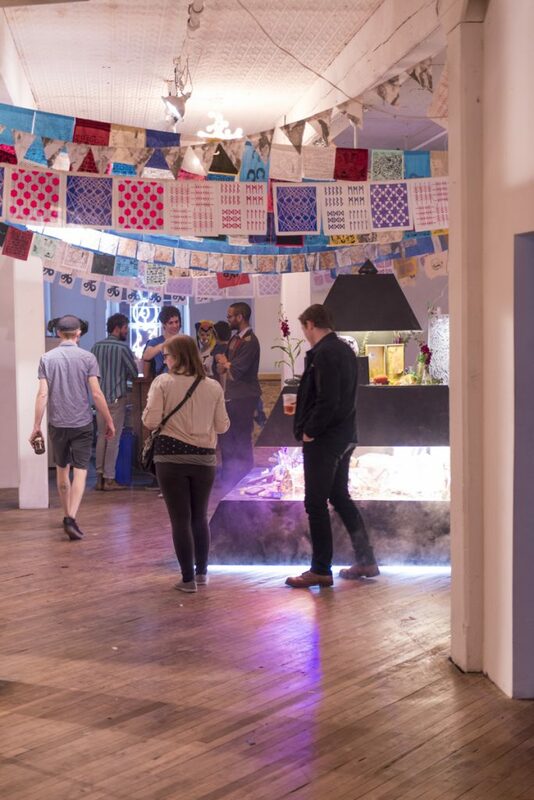 The exhibition didn’t just showcase Space 1026’s prolific production; it also celebrated the creative relationships between the people who, collectively, accumulated all this stuff. In November, Space 1026 was one of twenty-three local, artist-led groups—comprising more than 200 artists—to share stories, ideas, and practices through participation in CITYWIDE: A Collective Exhibition, funded by the Knight Foundation. From November 1 through December 6, CITYWIDE exhibitions, performances, panel discussions, and publications appeared in neighborhoods all over the city. West Philadelphia publishing center The Soapbox hosted an exhibition of painting by members of Kensington collective Highwire Gallery and distributed a poetry zine written in response to the show. 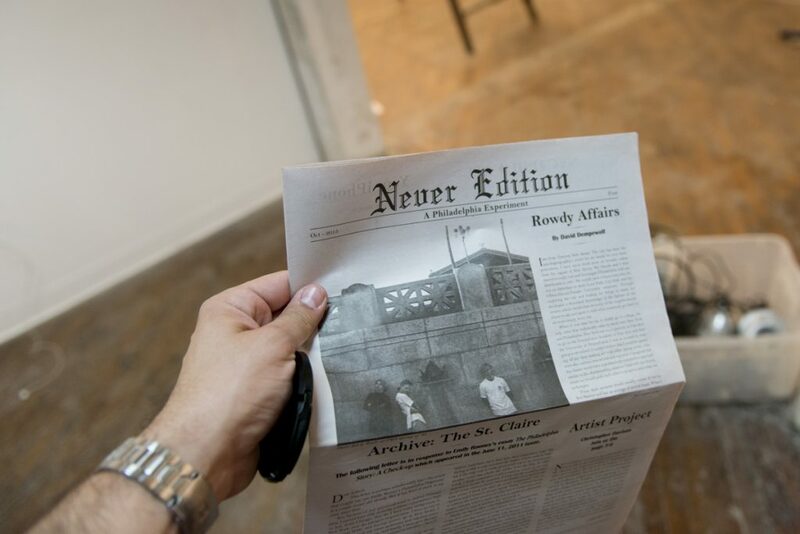 Title Magazine, The St. Claire, and McCartney/Belknap Projects published a four-issue, black-and-white broadsheet titled Never Edition that contained artist commissions, reviews, and interviews with local curators, including ICA’s own Grace Ambrose, as well as commentary on the state of the arts (funding; the fact that we’re not in New York; collective activity) in Philadelphia. The city’s art community has many tight cliques which are often defined by location. Members of gallery collectives are tied to their own First Friday and Second Thursday openings, where they might be pumping a leaky keg of Victory “Hop Devil” ale, slinging PBR, or ushering visitors into a performance involving painted dancers or live chickens. But now, CITYWIDE has opened up useful, new dialogue among artist-led groups and helped to make the whole community visible. “I’ve made friends at other collectives that I’ve looked at the work of but, before this, couldn’t put a face to a name,” says Dietrich, who has begun talking with many artists and galleries about potential projects. At CITYWIDE’s buzzing First Friday opening celebration at 319 North 11th Street in Chinatown—a beehive of creative activity—visitors, dressed up for Halloween in bright blue wigs and green, glittery eye makeup, explored Space 1026’s show at Vox Populi alongside exhibitions by Marginal Utility, Termite TV Collective, Basekamp, and Magic Pictures. 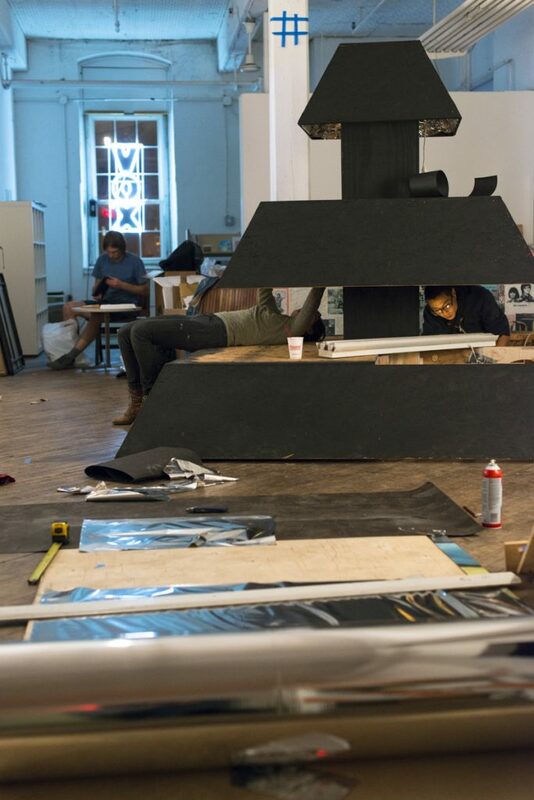 Termite TV presented SURVEY, a video installation animating the group’s twenty-two-year history in Philadelphia. A large black box inlaid with mirrors was this show’s centerpiece; a mini-projector swung, suspended just above the box, created Rorschach patterns of light inside it. Descending to the building’s second floor, people made excited introductions and drank spiced wine prepared on a hotplate by Sebastian and Sari of Kensington’s year-old co-working space Art/Assembly. Their web-based project Feedback Loop, a grid of CITYWIDE exhibition images projected on PRACTICE Gallery’s walls, encouraged much-needed critical debate on the city’s arts. 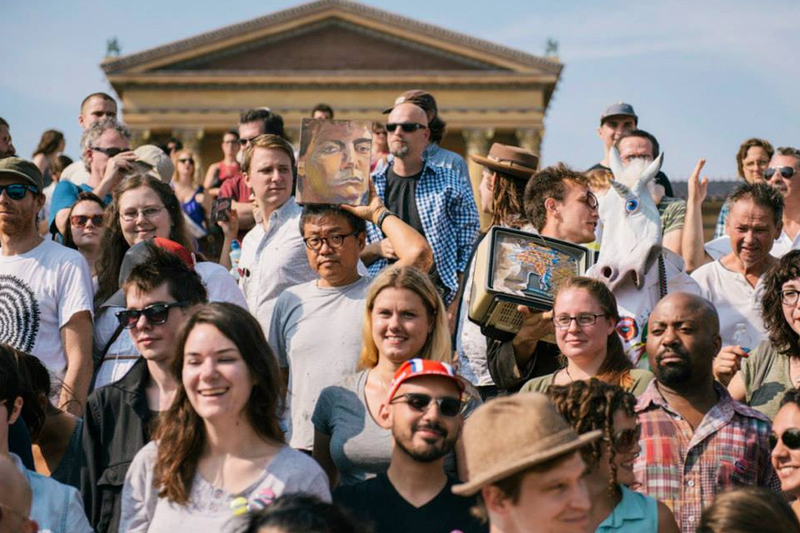 PICTURE DAY organized by PRACTICE, invited local artists and self-identified “art workers” to meet on a bright but brisk October afternoon and pose for a group photograph on the Philadelphia Museum of Art’s iconic steps. Taken by Constance Mensh (who often photographs ICA events) and Jaime Alvarez, the resulting images reveal an eccentric and diverse group who are getting to know one another gleefully, if a little awkwardly too. A skinny guy holding a gold, spray-painted television set whispers into his neighbor’s pointed white ears (he’s decked in a rubber unicorn mask), while nearby a young woman with a leafy, tattooed chest shares a step with a gray-haired lady whose arm is in a sling. Yellow-and-black (or red-and-blue) CITYWIDE stickers emblazon every shirt. In November, the Germantown gallery Mount Airy Contemporary exhibited prints of selected PICTURE DAY images. A bit like Afterlife’s assemblage of artists’ treasures, the assembled bodies speak both of familiar relationships and of friendships not yet formed.